A representative from Food & Water Watch, as well as the Hackensack riverkeeper, are speaking out against the $1.8 billion power plant slated to open in North Bergen by 2022. “First of all, the power is not for us. 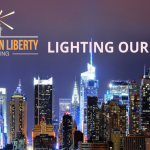 New Jersey does not have the demand for the electricity. The plant is to send all the electricity under the Hudson River into New York, yet all of the pollution and impact would stay right here in New Jersey,” Food & Water Watch New Jersey Organizer Matt Smith said during an interview at James J. Braddock Park. On top of the air pollution in an area, the border of Hudson and Bergen Counties, that already has poor air quality, Smith added that the project will have a negative economic impact: decreasing nearby property values by three to seven percent. 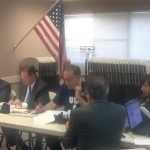 He also noted that the municipal council’s in Ridgefield, Bergenfield and Fort Lee have already passed resolutions indicating they were against the plant, which is formally known as North Bergen Liberty Generating. “It’s a dirty deal for New Jersey,” Smith later exclaimed. While the project already received initial approval from the state Department of Environmental Protection last month, Smith laid out why he feels the developer’s approach is disingenuous. “The way this gets permitted is really kind of a hoax and a scam. What the company is proposing to do is … simply buy credits to pollute, which basically means they’re trading,” he began. The way Smith sees it, “a few dozen permanent jobs” in exchange for decades of increased air pollution is a very bad deal that shouldn’t even warrant consideration. 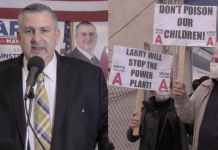 At the April press conference where officials announced that the power plant was on its way to North Bergen, state Senator (D-32)/Mayor Nick Sacco scoffed at the notion that the dilapidated area where the facility will be built is part of the Meadowlands. “They call this the pristine Meadowlands? 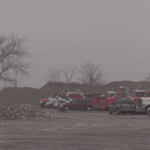 Are they kidding, we’re in an asphalt dump,” he said at the time. In response, Hackensack Riverkeeper Capt. Bill Sheehan explained that the value of the Meadowlands goes beyond just aesthetics. “Well, the Meadowlands is the flood plane of the Hackensack River. Flood planes have very, very important value in the communities because that simple term, flood planes, means this is an area that’s meant to flood. Nature intends this area to flood,” he explained. 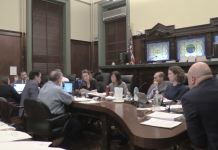 “Just because the power plant itself is cited on an industrial site, there are state preserved Meadowlands all around the proposed site,” he chimed in, noting that the power plant would require 2 million gallons of diesel fuel to be stored on site. 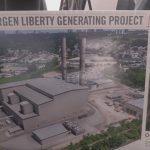 Environmental groups will be hosting a public meeting to discuss the power plant at Iglesia De Dios En Cristo La Senda, located at 300 75th St., on Wednesday at 7 p.m.
North Bergen spokesman Phil Swibinski expressed a different point of view, calling the project “a rare opportunity” that will only reach completion if it “is deemed completely safe” by state and federal agencies. 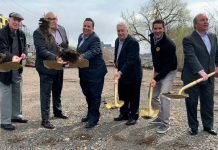 “North Bergen officials are excited about this project because it represents a rare opportunity to attract millions in sustainable, new tax revenue with little to no demand for additional services or increased costs,” he said in an email. 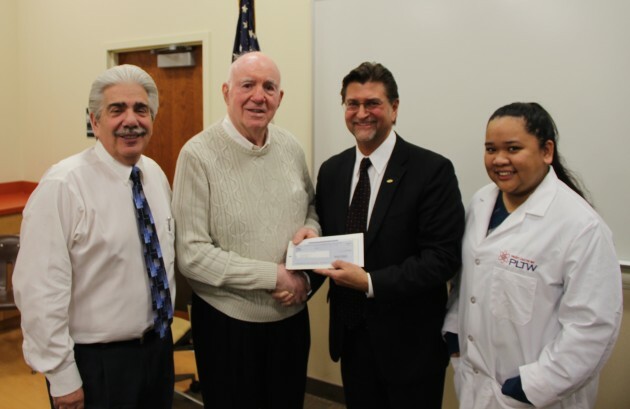 Swibinski continued that the site is located about a half mile away from the nearest residential area in North Bergen and therefore will not negatively impact property values – further stating that the revenue from the project will likely help keep taxes stable. A spokesman for NBLG did not return an email seeking comment. Have you tried “follow the money” trail? Try Nick Sacco, triple dipping crook first, and see what happens. Will the meeting re the North Bergen power plant be on 8/29/18 at 7:00 pm on Hudson Avenue? I called the Township of NB and they said no meetings are scheduled. I could use an update because several of us plan to attend. Thank you.